Leading up to the elections here in the U.S., and along with Chavda Ministries, we will be participating in a 40 day fast here at First Love Missions and we urge you to join us in fasting and praying for our nation, regardless of who is elected, and that she would return to the solid foundation of having God at the center. We will be posting more very shortly on the fast & prayer taking place between September 29 - November 7. We will carry the fast through the entire day of November 7, breaking it on the morning of November 8, 2012. This article contains some general fasting guidelines, with scriptural support, and will hopefully stretch your understanding of what fasting is all about. First of all, how you begin and conduct your fast will largely determine your success. By following these seven basic steps to fasting, you will make your time with the Lord more meaningful and spiritually rewarding. Also, fasting doesn’t mean water only. Fasting can be incorporated into any aspect of your life: from eating only clear broths or juicing to eliminating TV watching or Internet use or anything else that you do on a regular basis. 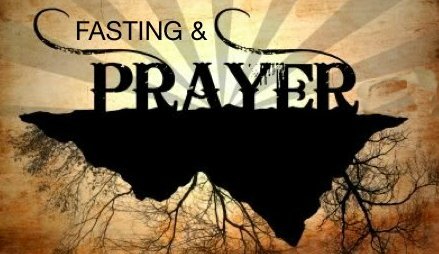 The entire purpose behind fasting is to deny yourself by abstaining from comforts and worldly pleasures (the natural) to use the time that you would be doing whatever (eating, watching TV, etc) in prayer (the supernatural). This is at the very heart of fasting. If anything we should not let on at all that we are sacrificing, not even if we explain that we are doing so to draw nearer to God. Fasting should be kept personal. **NOTE: We do not recommend a 40-day water only fast, except only if lead by the Spirit to do so and only then for those that are accustomed to a fasting lifestyle. Why are you fasting? Is it for spiritual renewal, for guidance, for healing, for the resolution of problems, for special grace to handle a difficult situation? Ask the Holy Spirit to clarify His leading and objectives for your prayers. This will enable you to pray more specifically and strategically. In other words pray for guidance about what you’re supposed to pray about. Through fasting and prayer we humble ourselves before God so the Holy Spirit will stir our souls, awaken our churches, and heal our land according to 2 Chronicles 7:14, which says “If My people, who are called by My name, shall humble themselves, seek my face and turn from their wicked ways, then will I hear from heaven, forgive their sin, and heal their land.” Make this a priority in your fasting. Making these commitments ahead of time will help you sustain your fast when physical temptations and life's pressures tempt you to abandon it. Pray for total forgiveness of our transgressions – BE SPECIFIC! Make restitution as the Holy Spirit leads you. Go and ask forgiveness or tell the brother or sister that you forgive them…this can be the most difficult of all. Psalm 103:1-8: “Bless the Lord, O my soul; and all that is within me, bless His holy name! 2 Bless the Lord, O my soul, and forget not one of His benefits— 3 Who forgives all your iniquities, Who heals all your diseases,4 Who redeems your life from the pit and corruption, Who beautifies, dignifies, and crowns you with loving-kindness and tender mercy; 5 Who satisfies your mouth with good so that your youth, renewed, is like the eagle’s! 6 The Lord executes righteousness and justice for all who are oppressed. 7 He made known His ways of righteousness and justice to Moses, His acts to the children of Israel. 8 The Lord is merciful and gracious, slow to anger and plenteous in mercy and loving-kindness. Galatians 5:16-17: “But I say, walk and live in the Holy Spirit; then you will certainly not gratify the cravings and desires of the flesh. 17 For the desires of the flesh are opposed to the Holy Spirit, and the desires of the Spirit are opposed to the flesh; for these are antagonistic to each other, so that you are not free but are prevented from doing what you desire to do. Avoid drugs if at all possible, even natural herbal drugs and homeopathic remedies. *Medication should be withdrawn only with your physician's supervision. Expect some physical discomforts, especially on the second day. You may have fleeting hunger pains, dizziness, or the "blahs." Withdrawal from caffeine and sugar may cause headaches. Physical annoyances may also include weakness, tiredness, or sleeplessness. Fruit juices, preferably freshly squeezed or blended and diluted in 50 percent distilled water if the fruit is acid. If you cannot do your own juicing, buy juices without sugar or additives. ** Apple, pear, grapefruit, papaya, watermelon, or other fruit juices are generally preferred. Begin your day in praise and worship. Nothing sets the stage and gets us into the presence of God faster than praising him. Pray for His vision for your life and power to do His will. Decaffeinated Herb tea with a drop of honey. **Avoid black tea or any tea with caffeine. Return to prayer and to the Word. When possible, begin and end each day on your knees, with your spouse, if applicable, for a time of praise, prayer and thanksgiving to God. Mix acidic juices (orange and tomato) with distilled water for your stomach's sake. Avoid chewing gum or mints (even if your breath is bad) They stimulate digestive action in your stomach. First, ALWAYS end your fast during the day and never at night. This will aid in digestion and in spiritual orientation. Start to end the fast between daybreak and noon for best results. Secondly, begin eating gradually and do not eat solid foods immediately after your fast. Suddenly reintroducing solid food to your stomach and digestive tract will likely have negative, even dangerous, consequences. Try several smaller meals or snacks each day. If you end your fast gradually, the beneficial physical and spiritual effects will result in continued good health. Expect Results and Keep On Praising Him!! The Lord will give you fresh, new spiritual insights. Your confidence and faith in God will be strengthened. You will feel mentally, spiritually, and physically renewed. You will see answers to your prayers. A single fast, however, is not a spiritual cure-all. Just as we need fresh infillings of the Holy Spirit each day, we also need new times of fasting before God. A 24-hour fast each week has been greatly rewarding to many Christians. Refuse to obey your carnal (worldy) nature! “Love God with all of your heart, soul, and mind” (Matthew 22:37). Appropriate the continual fullness and control of the Holy Spirit by faith on the basis of God's command (Ephesians 5:18) and promise (1 John 5:14,15). Read, study, meditate on, and memorize God's holy, inspired, inerrant Word daily (Colossians 3:16). Fast and pray one 24-hour period each week. Prayerfully consider becoming one of the two million Christians who will fast for forty days before the end of the year 2012. We encourage you to join us in fasting and prayer until we truly experience revival in our homes, our churches, our beloved nation, and in the entire body of Christ!